According to the U.S. Trends in Team Sports report, gymnastics has more participants of 6-12 year-olds than any other sport. More than 48% of all active gymnasts belong to that age group. When it comes to teaching the basics, gymnastics inclines are a crucial tool for any facility. At Greatmats, we offer inclines at competitive pricing in both folding and non-folding options. Instructors will find them extremely valuable for teaching all gymnasts from beginners to elite athletes. They are also extremely effective for use in cheerleading programs. Our gymnastics inclines are being used across the country in many capacities. Beginners in “Mommy and Me” classes can use them to learn the basics. Elite athletes training for international competition can use them to learn the most advanced moves. Inclines are great tools to teach work on bars, basic tumbling, floor exercises, and conditioning. The gymnastic incline is beneficial because gravity acts as an ally to the beginner to learn forward and back rolls. You can use the mats for greater momentum when learning back handsprings. They can also be used to teach vaulting. Try them for bridge kickovers, handsprings, or as a flyback station. If you lean them against a wall, you can use them to practice blind changes. Larger versions make it possible to perform consecutive moves. Use gymnastics inclines to teach gymnasts how to grasp the early stages of the reverse hecht. 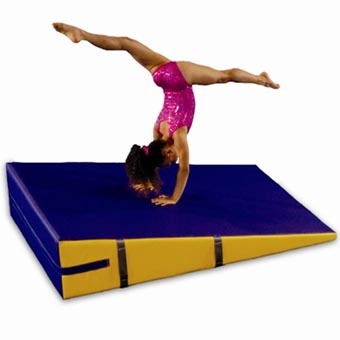 Also known as wedge mats or cheese mats, the gymnastic incline can also transform into firm mini-pits or spotting tables or blocks. Both our folding and non-folding gymnastics inclines are available in one solid color or two contrasting colors. We offer a number of different colors so you can find the incline that best fits your facility. Various sizes are also available. Gymnastics inclines are easy to clean, transport, and store.